CD review: "If I Can't Sell It I'm Gonna Sit On It"
Diamond Teeth Mary McClain, at 91 years of age, is one of the blues' great treasures. A contemporary and step-sister of Bessie Smith, McClain sang with her and others as the blues was born in the early decades of the 20th century. This recording of blues and gospel standards and contemporary blues was recorded in 1992 and 1993. Like Smith or Sippie Wallace, McClain is a "classic" blues singer, with a smooth, sophisticated approach born in the vaudeville and stage shows of the Roaring '20s. 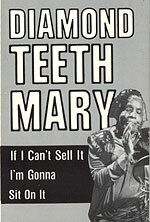 Diamond Teeth Mary's voice remains strong, her sense of timing sure and unerring. The backing bands (the album was recorded over several sessions) vary in their quality, but are generally strong and stay in the background. The three live cuts show a vigorous, enthusiastic performance by McClain, but the recording quality is poor  members of the audience can clearly be heard talking during the performance. But that is a minor complaint about a wonderful outing by a remarkable artist.